You were obsessed with them as a kid, but how much do you remember about the toy commercials from your youth? You're all grown up now, but when you were little, this time of year meant one thing: toys! You undoubtedly remember your favorite toy from when you were a kid, but do you remember the commercial that went along with it? Time to find out! For clarification, we're basing answers on the American names for the toys featured; all of the commercials used were aired in the United States. We apologize in advance for the somewhat less than optimal condition of some of the clips, but some of this footage is pretty darn old. As always, you can take as long as you like, but your overall time will affect your position on the leaderboards. When you're done, make sure you tell us your favorite toy from when you were small. 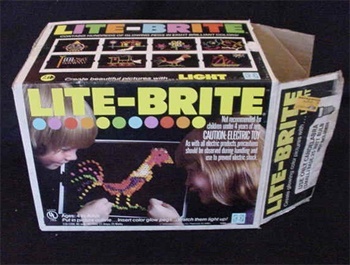 Mine, as you may have guessed, was Lite Brite. We had a lot of fun putting these together. Hope you enjoy them as much as we do!